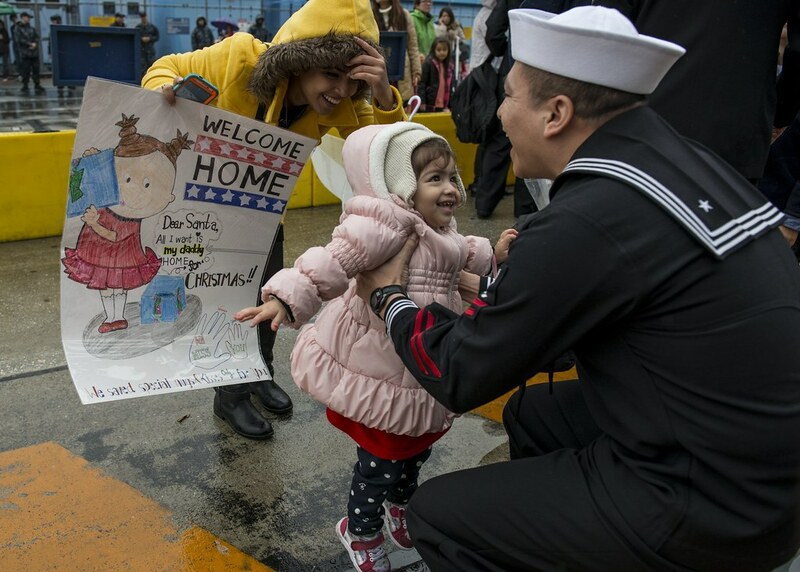 YOKOSUKA, Japan - The Nimitz-class aircraft carrier USS Ronald Reagan (CVN 76) returned to Commander, Fleet Activities Yokosuka, Japan, (CFAY) after completing her 2015 patrol, Dec. 3. Ronald Reagan became the U.S. Navy’s only forward-deployed aircraft carrier after a hull swap with USS George Washington (CVN 73) in August and departed CFAY Oct. 15 to conduct exercises to foster security and stability in the Indo-Asia-Pacific and to improve interoperability with her maritime partners. MCPON Mike Stevens and Chief Naval Operations Adm. John Richardson congratulated Ronald Reagan’s crew for successfully completing the hull swap prior to her departure from Yokosuka. After she set to sea, Ronald Reagan participated in two fleet reviews, the first with the Japan Maritime Self-Defense Force (JMSDF), which included a visit to the ship by Japanese Prime Minister Shinzo Abe and Commander, U.S. 3rd Fleet, Vice Adm. Nora Tyson, and the second with the Republic of Korea Navy (ROKN). She also participated in a bilateral exercise with the ROKN where they conducted air defense, surface and anti-submarine warfare drills. Following the Fleet Review, the Ronald Reagan Carrier Strike Group conducted Annual Exercise (AE) 16 with JMSDF, which included a series of training events that covered all warfare areas of air defense, and surface, sub-surface and electronic maneuvering. Ronald Reagan and its embarked air wing, Carrier Air Wing (CVW) 5, provide a combat-ready force that protects and defends the collective maritime interests of the U.S. and its allies and partners in the Indo-Asia-Pacific region.